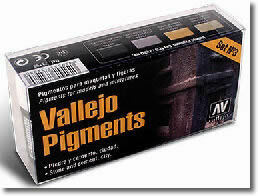 Vallejo bring you Weathering Pigments for your models there is a great range for all types of weathering. Pigments are used for weathering and ageing the finish of vehicles, armour, fortifications and structures; they are ideal for creating the effects of accumulated dust, mud, dirt and smoke produced by time and natural erosion. The pigments chosen for this range are all earth and iron oxides, especially suitable for all the different climatic and geographical conditions of the terrain of a diorama. They are pigments which are employed in the manufacture of Vallejo colours, and have been especially processed and micronized so that they are very easily dispersed in any liquid medium, from water to acrylic resins or turpentine. To adhere the pigment to the surface of the model Matte Medium is used, or Glaze Medium which dries more slowly and allows more time to simulate water and snow run-offs and to move the pigment into and around the details of the model. Many other special effects can be obtained by mixing pigments with the products in the Water & Stone range as for example with Transparent Water to achieve effects of oil and grease stains, or Sandy Paste to create a rough, coarse surface for heavy dried mud or flaking deep rust.